I had a lovely dinner party with family and friends, thank you! 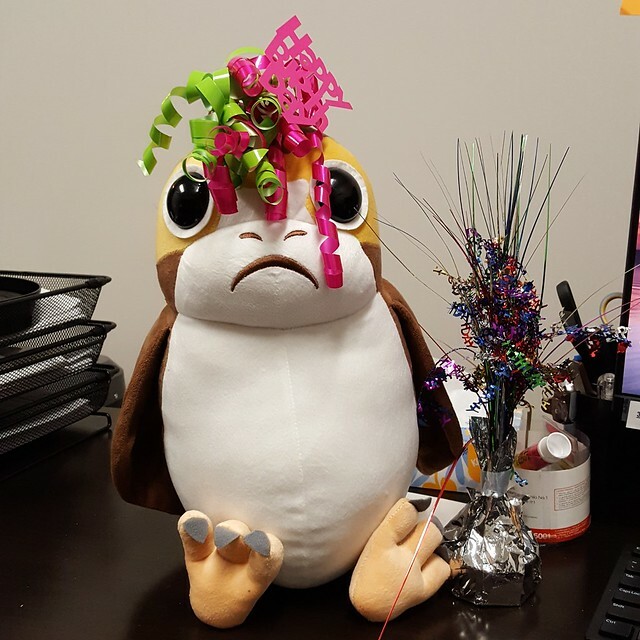 And here at the office I have a stuffed Porg wearing a party hat and two of my littles, so I guess that counts for a second celebration. I have to see a picture of this. Glad you had good celebrations all around. A Porg is a little bird-like creature who featured in The Last Jedi, because they filmed certain sequences on an island full of small birds (puffins, IIRC), and there were too many birds to edit them all out, so they just made in-universe creatures of them, LOL. Evie has a stuffed-toy version, who was (at least yesterday) adorned with a party hat. Yeah, you can see the happy writ all over him, can't you? His name is Pudgekin, by the way. Hi there, Pudgekin! You are awesomely cute. Your Porg is wearing your littles as well as a party hat??? Musta been SOME PARTY!! Balance one little on each shoulder, don't you know. Kind of the opposite to a parrot on the shoulder. Duncan and Helena getting a lift up on sweet Pudgekin. That must be why he looks so unhappy. Once you think you understand women.....you will find you understand nothing about women. Especially since he hardly has any shoulders! That stuffed penguin is the cutest thing ever!